Don’t knead the dough excessively, this way the bread will be soft. Combine the Bisquick and milk in a large bowl. Mix with your hands until the ingredients are well combined. Place the dough on a clean and floured surface (you can use Bisquick as flour) and knead 8 to 10 times at most. Cut the dough in half. Extend the first half with a rolling pin until it's less than 1/4-inch high, extend in the shape of a rectangle. Use a knife to cut the rectangle in half the long way and then make two equidistant cuts across. This way you'll have 4 squares. Cut each square diagonally to create triangles. Mix the BBQ sauce with the thinly chopped chipotle pepper and set aside. Cut the sausages in half. Take one triangle, sprinkle with BBQ sauce in the middle and place one half of the sausage on top of the sauce. Make sure to put the round part towards the central tip of the triangle. Wrap the sausage with two corners of the dough and place on the baking dish. Repeat until you've used up half of the dough. Then extend the other half of the dough and repeat until all the sausages are wrapped. Bake for 7 minutes or until the dough browns a bit. Let cool for 5 minutes and serve with the BBQ sauce on the side. If you can't find chipotle in adobo you can use chipotle powder or simple look for chipotle BBQ sauce in your supermarket. Last year I asked my oldest so what he would like me to prepare for his birthday and he said, "two things: pigs in a blanket and cake pops", and I prepared both! 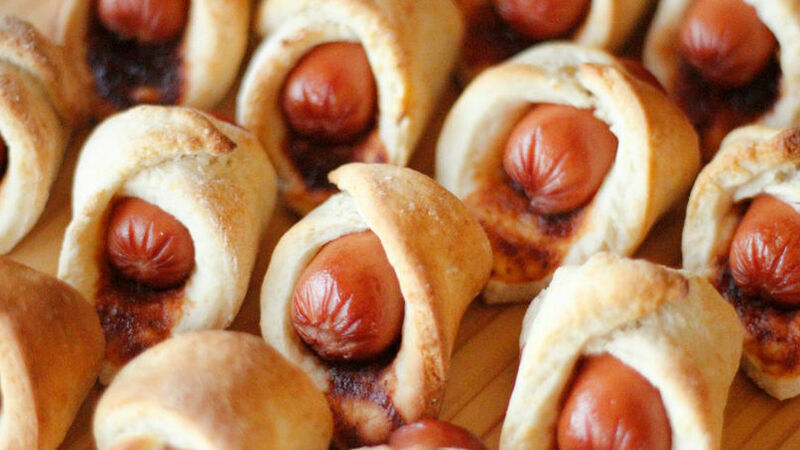 Making pigs in a blanket is very easy, it the perfect recipe for reunions, picnics, children's parties or when you need something to snack on. It's also a very versatile. Traditional pigs in a blanket include hotdogs and bread, but you can add other flavors to give them a different taste, like the recipe I'm sharing with you today. Just add a bit of BBQ sauce with a touch of smoky flavor from chipotle pepper and you'll create a unique taste.